Today is a very big day here for the SFFFools Guild! AC and Steve are officially competing in the Self-Publishing Fantasy Blog-Off (SPFBO) contest and Billy releases the third book in his Epik series, Sight Beyond Epik Sight. Naturally, with such a big day for the Guild, there's no reason for me not to put together another one of Marty's Famous Drinkable Menus! First up, in honor of Billy's new book, I created The New Release. Since new releases always come with a degree of hope, a degree of desperation, and a degree of just wanting to get drunk, this drink should get you all of those. A glass. It can be glass or not-glass. 8 oz. of tequila, preferable gold and maybe Montezuma. ​One bottle of wheat beer. Maybe a Hoegaarden would work (AC told me how to spell it). ​1. Set the glass down on a table, counter, or mini-fridge. 2. If desired, drop a few ice cubes in the glass. 3. Pour in the tequila and swirl it to get the ice making it nice and cold. 4. Splash in the beer. Avoid getting a 'big head' (*rimshot*). 6. Forget about your new release. ​The other drink was a little tougher, since it has to represent competition. The SPFBO was tricky but I think I nailed it. It should combine some nervous excitement at the start and finish incredibly bitter. 2. Get the rim wet (oh yeah) and coat the rim with a mixture of pop rocks and sea salt. This is critical. 3. Pour in the Jagermeister to a shaker. 4. Pour in the coffee liqueur. 5. Add in the two dashes of bitters. 7. Shake it like a Polaroid picture. Just kidding, don't shake Polaroids. It destroys the film. 8. When the drink is shookened, pour into the glass. 9. Lick the rim (oh yeah) and then kick the drink back. 10. Congratulations, you've been eliminated in the first round. I mean, you competed well. ​Good luck to all drinkers! I’ve always wished I could grow a beard, but no luck so far (though I secretly suspect that Steve has been sneaking into my room to shave me in the middle of the night). 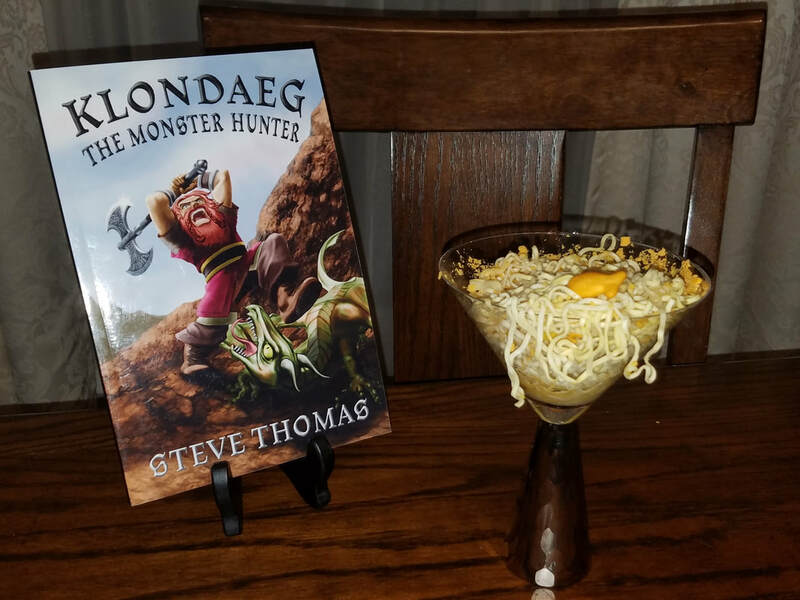 When I read Klondaeg the Monster Hunter, I was always jealous of Klondaeg's beard, all bright orange and full of miscellaneous crumbs. I may not be able (or allowed) to grow one, but I’ve figured out how to mix one! Pour the boiling water over the ramen and wait until the noodles are soft and edible. While they warm up, put the Goldfish crackers in a plastic bag and mash them up with a rolling pin. By now your noodles should be ready, so strain them and put them in the martini glass. Add the Goldfish crumbs and vodka, then stir. Enjoy eati--I mean drinking your delicious cocktail! Okay, so everyone is making such a big foo-faw over a book-reviewing owl and her amazing drinks and reviews and all that and I thought, you know, I can do alcohol stuff too. So I'm going to. Because I've been forced to read every book or novella written by all five current members of the Guild, I know what drinks pair the best with the reading experiences provided by the books. Yeah, that sounds professional. Leave that in. Right. 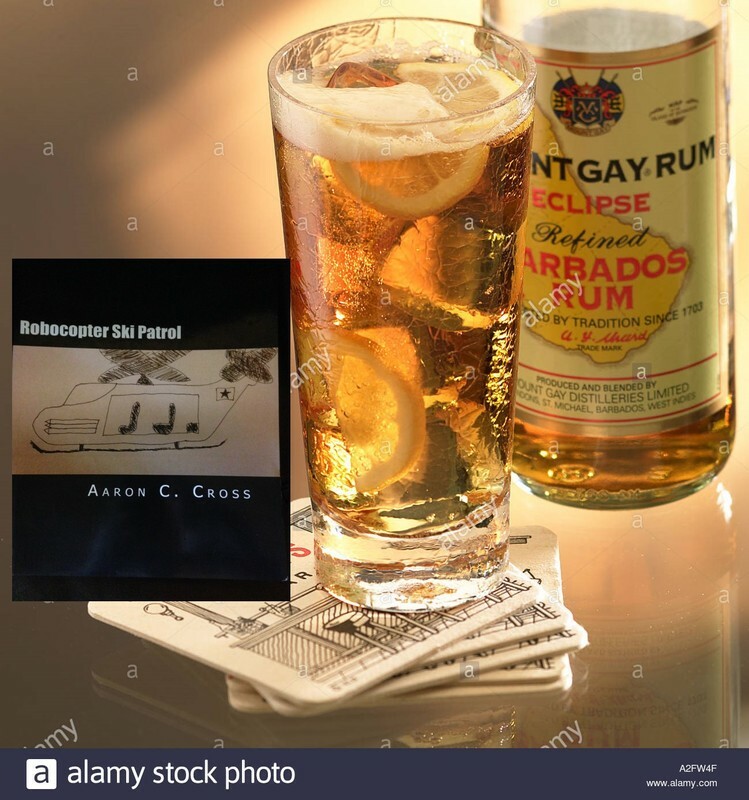 So, I figured the best place to start would be with the most drunkened of the Guild - AC - and his book (which I am legally required to list as a SPFBO entry...sigh): Robocopter Ski Patrol. So, in the book, there's a scene where a stupid character named Ace Wifflacor (I hate AC's naming system) is getting drunk on a transport plane and runs out of mixers, so he has to make a substitution, which ends in predictable results. Namely, he blacks out and wakes up in the middle of a firefight in the city of Prague right before a nuclear bomb drops. No, it doesn't make sense in context either. This, like that, is The Ace. Anyway, it's a really easy recipe, so try to follow along. Many fluid oz. of rum, preferably toilet bowl cleaner-grade but also gold. None of that white rum crap. 3. Pour in as much rum as you want. More is probably better. 4. Top with a generous glug of rubbing alcohol. Owls think they're so fancy with their websites and many of readers. Well, I can make drinks too!